New Orleans Mayor Mitch Landrieu speaks about New Orleans' emergence as a model of urban renewal and economic recovery 10 years after Hurricane Katrina during a visit Tuesday to the National Press Club in Washington, D.C.
After the levees broke 10 years ago in New Orleans, tens of thousands of residents fled the city and never returned. They resettled in 32 states around the nation, many of them landing in Houston. New Home Family Worship Center also relocated to that city and became the spiritual family for a dislocated and homesick congregation. Most of the people who came to a special worship service Thursday night were born in New Orleans. With "Katrina 10" projected on the screen behind the altar, Pastor Robert C. Blakes introduced his special guest. "So tonight our mayor, the mayor of our beloved New Orleans, Louisiana," he said to applause. "Yeah. I don't care where you put your head down at night, you're 504 at heart, aren't you?" 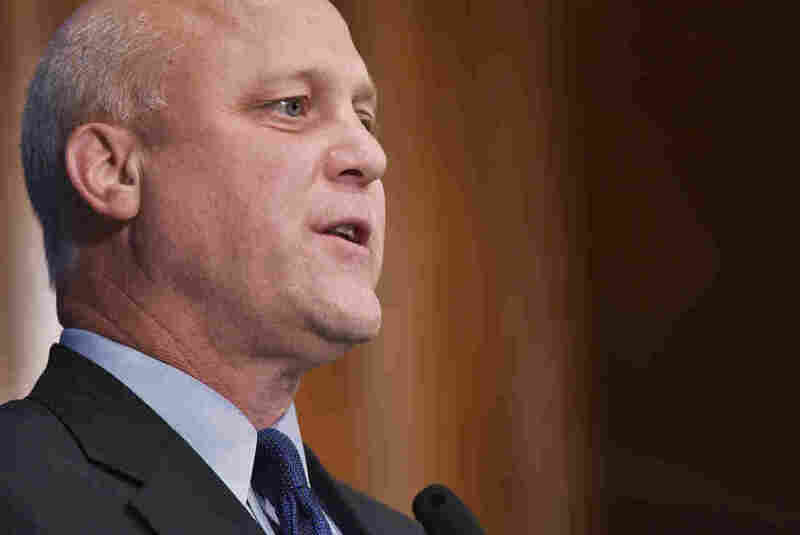 This week, Mitch Landrieu made stops in Washington, D.C., Atlanta and Houston to proclaim that New Orleans is not only surviving, but thriving, as well as to thank America — and the two southern cities in particular — for helping his city after it was nearly obliterated. But, also to call his people home, to tell them their hometown is a better place today than it was when they left. "I know y'all are over here, and y'all are in Houston, I appreciate it. I do," he said. Y'all know y'all can come home whenever y'all want." Around the country, Landrieu has evangelized for post-Katrina New Orleans, recounting the long, hard road from 2005 to 2015. "And we have started to rebuild your city in a way that you should be proud of and that you would love," he said. New Orleans has rebuilt many of its neighborhoods. It's encircled by a new nearly $15 billion flood protection system. There's a new network of primary health clinics. Academic performance in public schools has improved. And Forbes Magazine listed New Orleans as America's No. 1 "brain magnet." Problems remain, to be sure. Parts of the city are still blighted — such as New Orleans East and the Lower Ninth Ward. And real estate prices have soared, meaning some families cannot afford to come back. But, as the mayor says again and again, there's no place like New Orleans. "We don't talk the way anybody else talks, we don't dance the way anybody else [dances]," he said. "They don't eat the way we eat, they don't hug the way we hug, they don't love the way. It's just different. And it's wonderful. Because you know what? I love Houston. Houston's one of the great cities in the world. I love Atlanta. "But you know what? New Orleans does not want to be Houston or Atlanta. What we want to be is the best version of our real selves, because we are unique." And that's what the people who came to church Thursday night said they missed most about their native city, which is six hours away. Chantel Hodges Jones is originally from New Orleans East and has a good job at MD Anderson hospital in the Texas Medical Center. When she's in her kitchen, she said she tries to enlighten Houstonians. "Well I'm a cook and I've introduced a lot of things to Houston, like I've introduced good gumbo to Houston. I've introduced good red beans and rice to Houston," she said. "When I go home I'm lookin' for a po'boy. I'm lookin' for shrimps that come out of the Gulf or out of Lake Pontchartrain." Their reasons for staying in Houston have to do with practicality, not lifestyle. Houston has more jobs, higher salaries, better housing, less crime and Houston had better public schools when they arrived. But when Latrice and Terry Lowery go home to New Orleans — which is frequently — they bring back a big bag full of things they can't find in Houston, such as pralines, pecan popcorn, Elmer's Chee Wees snack food, and thin-crust French bread. "There's no place like home, especially New Orleans," Latrice said. "I tell people at my job all the time, they say, 'You've been here for 10 years, this is your home.' I tell 'em, 'No, New Orleans will always be my home, no matter what." The Lowerys miss home terribly, but they cannot answer Mayor Landrieu's plea to come back — at least not now. Their kids are enrolled in Houston schools. They both have solid jobs. They bought a home here. But when they retire, their fervent dream — the thing they think about all the time — is to move back to the city of their birth.